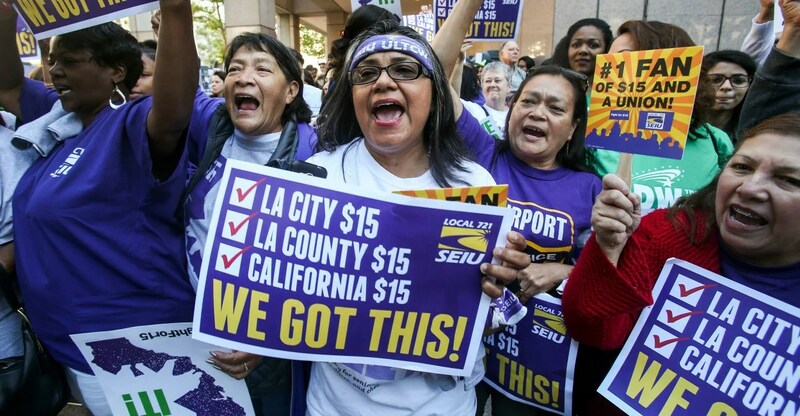 The Los Angeles City Council isn’t currently planning to further discuss a proposal exempting union members from the southern California city’s new minimum wage, despite the proposal having the backing of labor unions. A spokesperson for Councilmember Curren Price, chairman of the Economic Development Committee, told The Daily Signal the union exemption isn’t moving forward and there are no plans to revive the discussion surrounding collective bargaining agreements. The Los Angeles City Council’s Economic Development Committee discussed a proposal Tuesday that would carve out an exemption for unionized workers from the new $15 an hour minimum wage, which would be phased in by 2020. The proposal was spearheaded by Rusty Hicks, executive treasurer-secretary of the Los Angeles County Federation of Labor, AFL-CIO, and was first floated last year. However, the potential exemption quickly became the subject of much scrutiny, and the measure was temporarily tabled. The Los Angeles County Federation of Labor, AFL-CIO, did not respond to requests for comment. Following news that the city council was expected to address the exemption once again, labor experts not only criticized unions’ push for such an exemption, but highlighted how the exemption elevated the needs of organized labor over the needs of the workers represented by the unions. “If there is an exemption, I don’t see how that benefits the workers,” Ed Ring, president of the California Policy Institute, told The Daily Signal. “This is to the advantage of the companies and the unions. The Los Angeles County Federation of Labor, AFL-CIO, represents 300 local unions in Los Angeles County. It, alongside other labor unions like the Service Employees International Union (SEIU), emerged as the most vocal in support of a $15 an hour minimum wage. Organized labor also vehemently opposed offering exemptions to specific businesses like restaurants. As Los Angeles inched closer to passing its ordinance raising its minimum wage to $15 an hour, however, Hicks began pushing for an exemption to the wage hike for businesses with unionized workforces. In a previous statement, Hicks said that an exemption was needed as a way to preserve collective bargaining agreements and allow companies and unions to negotiate a wage below that required under the law in exchange for other benefits. “This provision gives the parties the option, the freedom, to negotiate that agreement, and that is a good thing,” he said. Ring with the California Policy Center said that there is validity to Hicks’ argument of wanting to allow workers to secure other benefits in exchange for a wage lower than $15 an hour. However, he stressed that passing an exemption for union members would have given businesses an incentive to push for unionization. “The reasons why the unions would want an exemption is because if you have an exemption for unions, then … [it gives] labor intensive businesses that have a lot of low-wage workers … an incentive to unionize because if they unionize, they might be able to lower their labor rates by 10 to 15 percent more,” he said. “It’s hard to look at that without considering it to be a very cynical move on the part of the unions,” Ring continued. Because many cities, Los Angeles included, are phasing in $15 an hour minimum wages over a span of several years, the impacts such a wage hike will have on businesses and the workforce aren’t known. However, small businesses across the state of California are already bracing themselves for the impacts higher labor costs will have on their bottom lines. California Gov. Jerry Brown, a Democrat, signed a bill into law last week raising the state minimum wage to $15 an hour in 2022—two years after Los Angeles’ wage hike will take effect. Because businesses are anticipating higher labor costs, James Sherk, a research fellow in labor economics at The Heritage Foundation, said an exemption for unionized workers makes unions appear to be the more enticing—and cheaper—option for businesses. While Hicks’ proposed amendment earned him criticism from the business community, he’s also seen pushback from fellow labor leaders. Dave Regan, president of SEIU-United Healthcare Workers West, spoke out against the pursuit of exemptions from minimum wage hikes. While the Los Angeles city council debated the exemption for union members, other cities that raised their minimum wages above state and federal levels included such carve-outs. San Francisco, Chicago and San Jose, Calif., all included exemptions for union members in ordinances raising their minimum wages. Melissa Quinn is a senior news reporter for The Daily Signal. Send an email to Melissa.